Carl Chinnery, his four brothers and his father all contracted polio within three days of each other in 1942. When he was growing up, his mother and father hardly said a word about it. He knew very little about it; he had no first-hand memories of being sick. In 1999, Chinnery asked his mother for some recollections of their struggle for a presentation he was to give to his local Rotary Club. Carl’s brother Bill was the first to come down with “poliomyelitis,” she wrote. Next was brother George. She writes of not being allowed to go in to the hospital with George, then calling the boys’ father, who drove all night to get to the hospital around 4 a.m. He wasn’t allowed in to see their boy, either. He came home to be with his wife and family. Around 7 a.m., the phone rang. Today, Carl Chinnery is an attorney in Lee’s Summit. For the most part, he recovered from polio, though his chest didn’t quite fill out, his back is “screwed up” and one leg is about an inch and a half shorter than the other. His other brothers also survived. 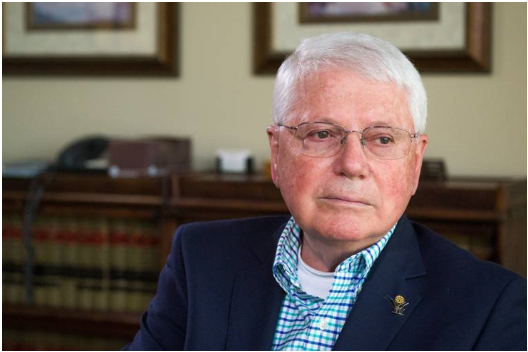 He estimates he’s given more than 250 presentations about polio and Rotary Club’s efforts to eliminate the virus around the globe.That he became involved in Rotary, which has become synonymous with polio-eradication efforts, was more accident than intent. In 2012, Chinnery traveled to India on a mission with Rotary to vaccinate children there. His group set up in a village, then went house to house, vaccinating as many children as they could find. Going through the villages and giving the drops to kids 5 years and younger, it was the proverbial eye-opener.